Much like Facebook, we have developed a PAGE that you can manage for your Tournaments. Up to now, organizers have had the expense and time in creating a website that only gets used for a couple of months of the year. That has been fine but now WWS is stepping in to make your lives easier and save you money. We see that by taking the concept of Facebook Pages we can keep all the traffic on one site where they will regularly visit multiple Tournament pages all year round as we help promote them and help with content. This template allows you to provide all the information for your tournament to the spectators and athletes. Some basic data is included by WorldWaterSkiers but you can fill out as many fields as you wish to give a better viewing experience. 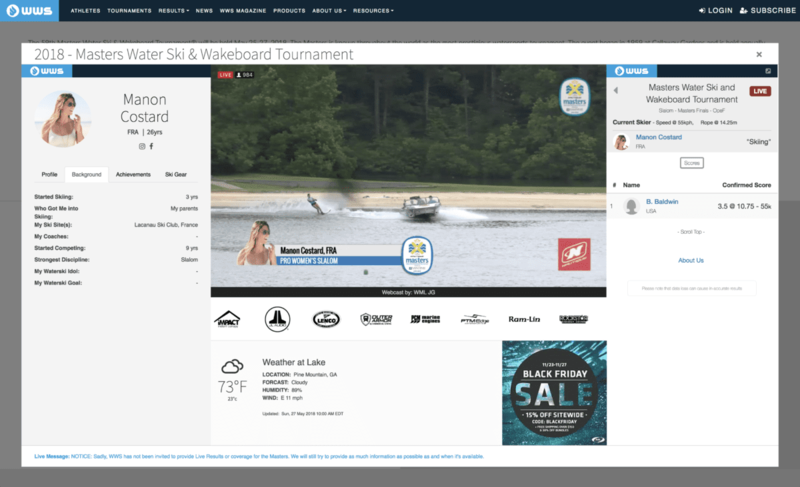 Along with information, you can upload images, logos, videos, sponsors, schedules, participants, and more. We have incorporated WWS, IWWF and WSTIMS scoring so that your viewers get everything on the page. We have also made it possible to embed Live Webcast Players and YouTube Live Chatrooms. One of the advantages of using WWS scoring is that we can also provide athlete profiles that update as each skier is on the water. Below you can see what our Live Window displays during a Tournament. Now you know what we are offering and why we want to get every Tournament onboard, you can click the button below on how to create your Tournament Admin Account.